The regional President Dan Balmer will supervise the MENAT team. On the conclusion of the last race of the FIA Formula One Etihad Airways Abu Dhabi Grand Prix, Aston Martin Lagonda joined hands with Yas Marina Circuit and became its official partner in the Middle East. 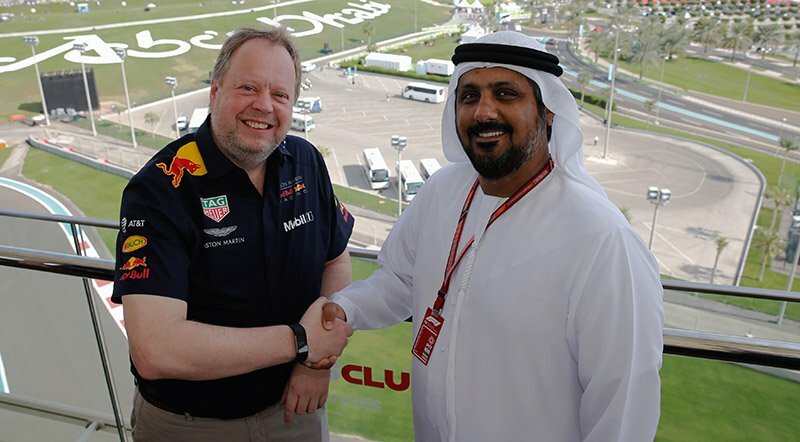 The deal was signed by Dr. Andy Palmer, Aston Martin Lagonda President and Group Chief Executive Officer and Al Tareq Al Ameri, Chief Executive Officer Yas Marina Circuit last Saturday. “The region is extremely important to Aston Martin and this new partnership reflects this. I’m particularly proud that we are establishing our new regional office at Yas Marina Circuit, allowing us to continue our ongoing investment in people and the expansion of the brand in the Middle East,” said Dan Balmer. This step strengthens Aston Martin’s commitment toward competitive motorsport. The British automaker is already competing in the top-level competitions with Aston Martin Red Bull racing in Formula One and Aston Martin Racing in the World Endurance Championship (FIA WEC). Aston Martin will provide six new generation Aston Martin Vantage GT4 race cars to Yas Marina Circuit next year, which will reside there permanently. The racecar will make its first international appearance on Saturday 15 December 2018 in the Gulf 12 Hour Endurance Race. Behind the wheels of the GT4 will be Aston Martin Racing factory team that will run together with three new Vantage GT3 cars supported by associate teams namely TF Sport, Beechdean AMR, and R-Motorsport.